At a time of year when most people are thinking about cutting down and decorating Christmas trees, Peter Ormond wants you to consider planting some instead. 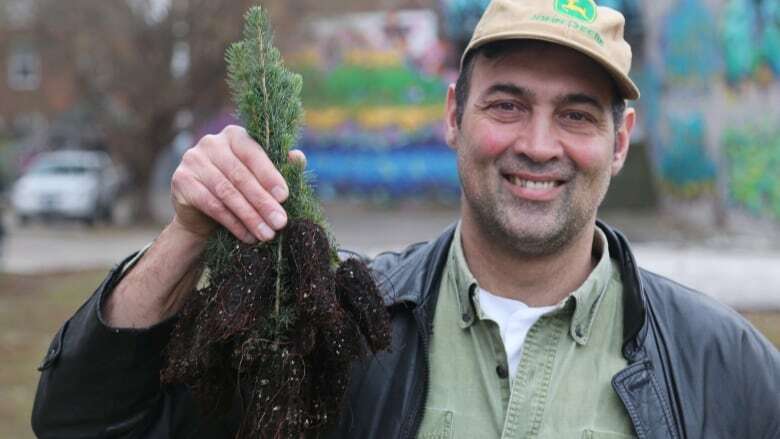 The Hamilton man and former Green Party candidate marked the holiday season this year by purchasing 1,000 white spruce saplings and is handing them out free of charge. "In the spirit of climate change," he said, "the Christmas tree is a perfect opportunity to rethink the annual harvesting of a seven-to-eight-year old crop of trees to decorate our home for two weeks." "We don't have to cut down a forest every year. We can plant a forest." Ormond said he spent $1,400 to buy all the tiny trees, a figure one of his colleagues told him could have covered a two-week vacation to Cuba instead. "I'd rather invest in our future than sit on a beach for two weeks," he responded. This project lives beyond me. It will make a difference." Ormond has handed out pear trees in the past, but this is the first time he's tried conifers. He said he has no problem with people who enjoy a real tree at Christmas, or the farmers who make their living providing them. But he wants people to consider planting something to replace what they remove. "Why not let the tree grow and you'll get all sorts of creatures living on it too?" he asked. "You can adopt a tree and have a live tree rather than cutting it down for a single use." The conifers have proven popular, especially among teachers and organizations who picked them up in 25-tree kits. Ormond says all but about 200 of the trees have already been handed out. To pick up a tree contact Ormond on Facebook by emailing ormondpm@yahoo.ca.